A New Jersey family is calling the birth of their son a miracle after a seemingly uneventful pregnancy took a dramatic turn within two months of the due date. The first-time mother and her newborn son survived a potentially life-threatening delivery as a result of the highly-skilled staff and advanced technology inside Englewood Hospital's new Hybrid Operating Room. This Hybrid Operating Room is equipped with state-of-the-art technologies from Skytron & Siemens including LED surgical lights, ceiling mounted equipment booms, and a ceiling mounted imaging system. The patient says she was seven months pregnant when she first began to feel pain in her upper right abdomen. Not wanting to take any chances, she immediately scheduled an appointment with her gynecologist, who sent her for further testing. An ultrasound revealed a plum-sized aneurysm in an artery that feeds into the spleen, which had the potential to be fatal to both mother and baby. The patient's gynecologist explained the severity of the situation and urged her to consult with world-renowned vascular surgeon, Herbert Dardik, MD, chief of Vascular Surgery at Englewood Hospital and Medical Center. "Once we saw the size and location of the aneurysm, we knew a natural birth was simply no longer an option," explained Dardik. "We had two lives to consider and the contractions alone could have caused the aneurysm to rupture, which was of major concern to us." Dardik met with a team of vascular technologists and other medical experts at Englewood Hospital. They determined the best option for both mother and baby was delivery by a cesarean section at 37-weeks in the Hybrid Operating Room. "Englewood Hospital's Hybrid OR provides the traditional aspects of an operating room with the most advanced imaging technology available," said Dardik. "Those features allow us to perform open and minimally invasive procedures with the benefits of real-time x-rays in one room at one time, making it the ideal place for this particular high-risk case. Its unique environment and advanced technology allowed us to perform the C-section and monitor the aneurysm in real-time - all in one space." Englewood Hospital's vascular technologists monitored the patient, baby and the aneurysm for the remainder of the pregnancy. "We saw the patient every two weeks up to the delivery date," said Amy Coyle, RVT, manager of the Vascular Lab at Englewood Hospital. "We needed to watch the aneurysm closely to track its size and make sure it was not getting larger." On the morning of the delivery, teams from every discipline necessary - surgeons, interventional radiologists, neonatal experts and anesthesiologists - were on stand-by, ready to respond if the aneurysm suddenly burst. All were prepared to immediately intervene and perform a minimally invasive procedure without having to move the patient to another operating room. "Everyone in the OR made me feel very comfortable during such a nerve-wracking time," said the patient. "My nurse was absolutely amazing. She held my hand throughout the entire delivery. I was very nervous about all of the IV's and needles, but my anesthesiologist took the time to explain everything that was happening to me. I immediately felt more at ease because of their kindness and compassion." A short time later, a healthy baby boy weighing 5 pounds and 14 ounces was delivered safely without impact to the patient's aneurysm. Days after the delivery, the proud father cradled the infant in his arms and explained the arrival of their firstborn son was a miracle in two senses. "We never would have known my wife had the aneurysm had it not been for the baby and how he was positioned," said the patient's husband, now a proud father. "Of course, he's also a miracle because of the extreme circumstances surrounding his birth. But he's here now and he's healthy. We are so grateful for that. We were definitely in the right hands throughout this whole ordeal." The patient continues to do well and is scheduled to return to Englewood Hospital, where Dardik and interventional radiologist Phillip Bahramipour, MD will perform a minimally invasive closure of the aneurysm to aid in her return to good health. Designed for vascular and cardiac patients, the Hybrid OR combines the capabilities of a cardiac catheterization lab (Philips FD20 Imaging System) with a cardiac surgery operating room (Skytron Surgical Lights, Skytron Equipment Booms, Skytron Surgical Displays), offering patients who need complex cardiovascular surgeries new options. 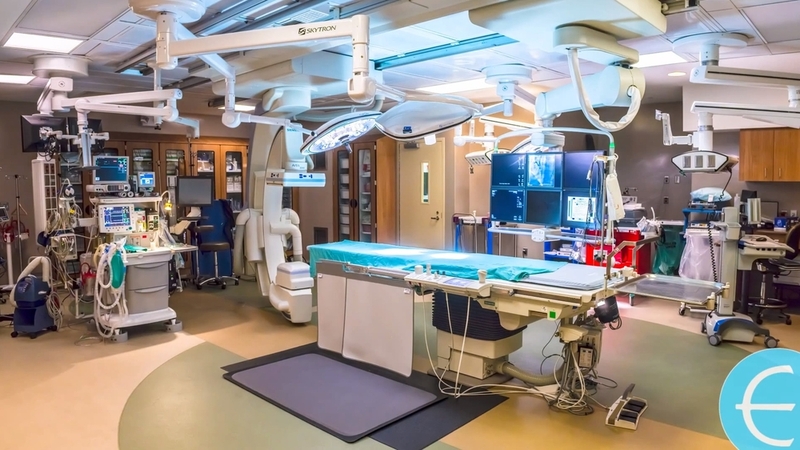 The innovative Ronald and Helen Lefcourt Hybrid Operating Room at Englewood Hospital merges the latest imaging technology of a radiology suite with the amenities of a traditional operating room. The availability of the Siemens Artis Zee imaging equipment means physicians can view a surgical area on high-definition monitors to perform advanced, image-guided cardiac, vascular, and neurosurgical procedures. And the state-of-the-art operating room setting with Skytron Surgical Lights & Skytron Equipment Booms allows surgeons to safely transition from a minimally-invasive to an open procedure without moving the patient, allowing surgeons to respond more effectively to intricate cases. This provides a high level of patient safety for those undergoing complex procedures. 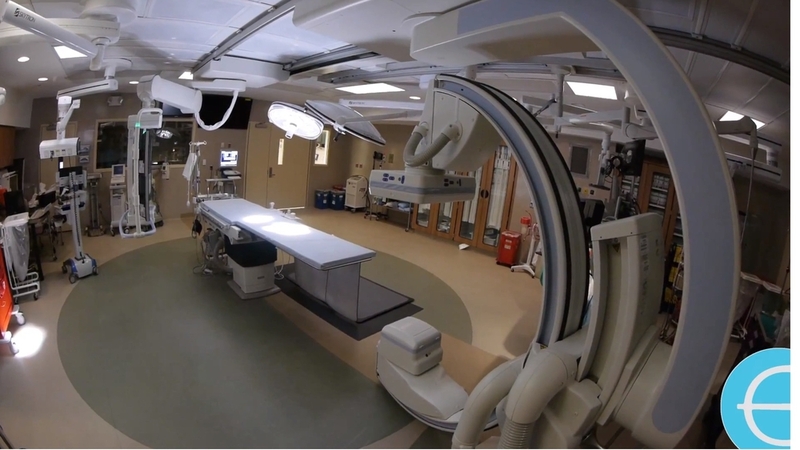 The hybrid operating room also enables surgeons from various specialties to work together as it houses all the latest tools and technology needed for both minimally invasive procedures and for open surgery. Surgeons can even perform two procedures at the same time if the need arises.